Finished this tonight. And hmm… not quite how I’d envisioned it. I made the V more shallow, of course, and so I wouldn’t ahve to deal with the ties around the waist I made the lower portion more of a bias cut for fullness. 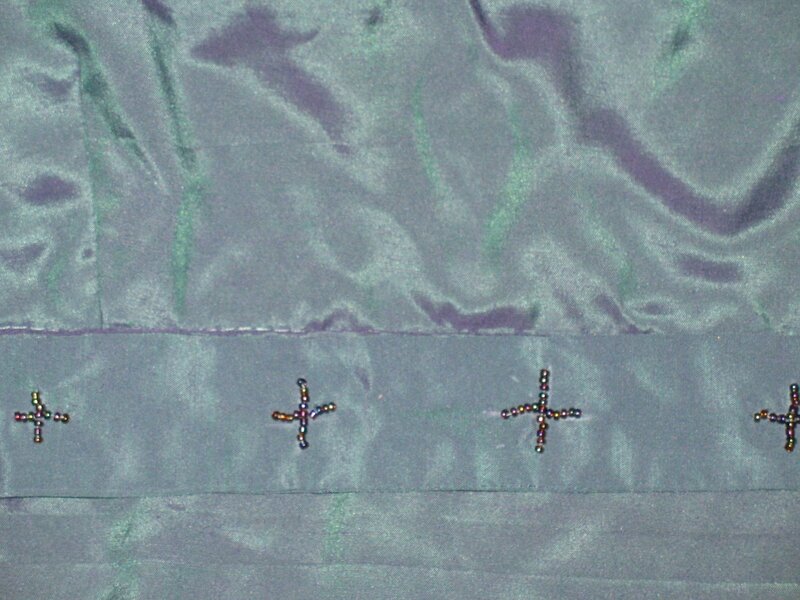 I was originally planning to do the extra criss-cross ties, but didn’t have enough twill tape. And I’m thinking I may need to tighten the ties around the shoulders, because it doesn’t look right. So honestly, I’m not entirely sure if I like this one. 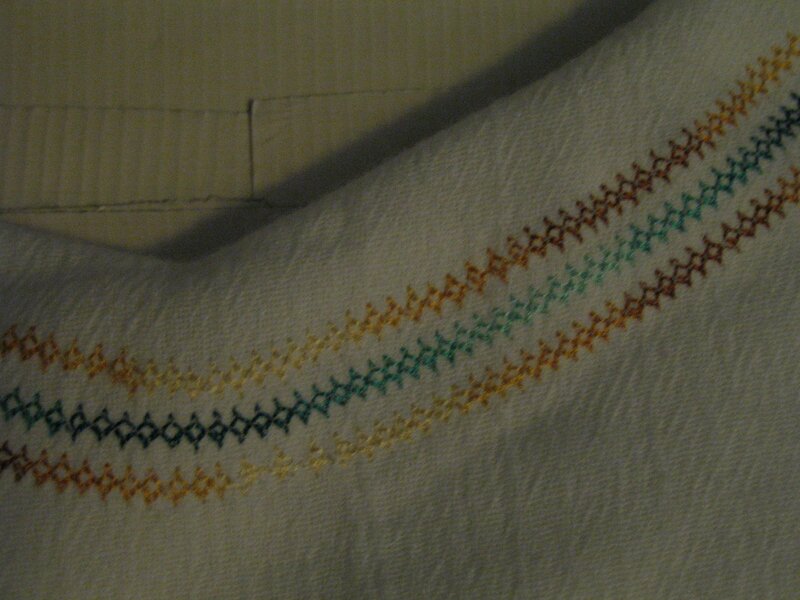 And this is the closeup of the decorative stitching. I really like how that turned out, at least. Not as subtle as the original, but I was pleasantly surprised at how well the varigation lined up, especially since the light and dark sections of the brown and teal alternated in a really cool way. The necklace isn’t done yet. Over halfway though. As of tonight, I have one half of the shell necklace redone, though it was further complicated by the string being too short and having to figure out a way to tie on another piece so it would stay (with a little help from some nail polish.) I’ve also started stringing the strand for the second. Not sure I’ll finish it tomorrow, because now that my two heavy teaching days are out of the way for this week, and I have nothing better to do right now since I got laid off from the coffeeshop (not really sure what to do yet about looking for another job, since I’d need to take off 3 weeks in July and it’s nearly June), I think I might do some more sewing then instead. Also realizing I need to figure out what to do with the other part of the shell stash– similar shells, but in a black/charcoal instead of gold. I’d prefer to do a different style necklace if at all possible, and I mght as well think about it while I have a huge stash of the clear seed beads out and readily available. 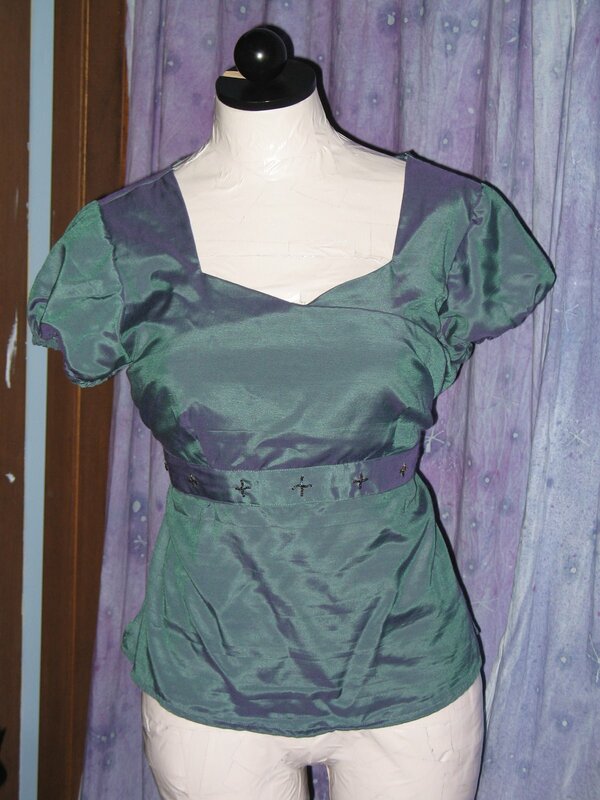 I started sewing together the Wharf blouse on Friday night, though most of the sewing was actually decorative stitching. I really like the way the varigated stitching turned out though. I’m currently attempting to fix my seashell necklace, since one of the kids at my teaching job broke it. It would have been fairly simple, only involving running a string through one strand of it, but then a seashell just broke off the other strand. So now I have to remake it. *facepalm* So this entry’s mostly for my own reference, so I know how many beads and such. And the finished product! I finished it on Saturday, but just got a picture this morning. 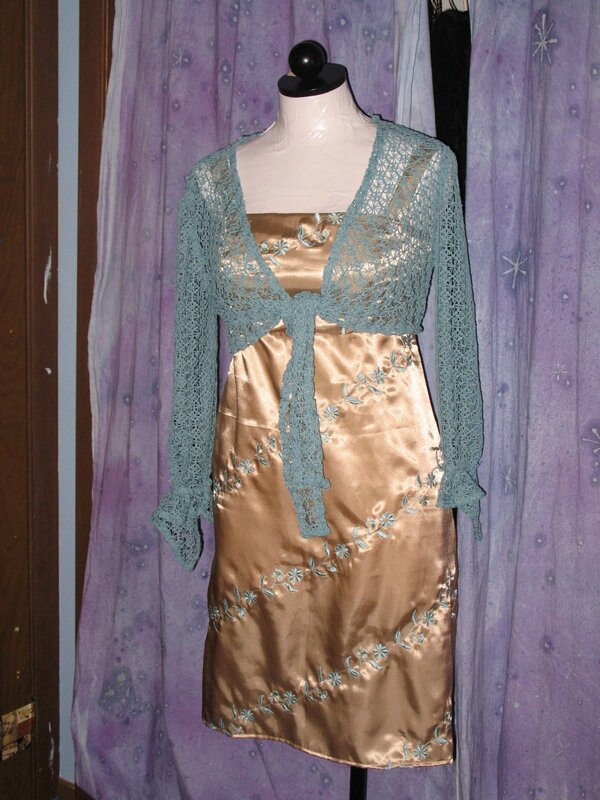 I wore it on Monday and the gathering on the side worked just fine, though I think I may need to put some kind of snap or hook and eye in there just to get the crossover to stay in place–otherwise it has a tendency to sag over the beaded band. This is my next project, from last summer’s Anthropologie collection. I got the stuff to make it then but ran out of time. So I spent a good chunk of Saturday trying to draft a bodice pattern from this book. I was just doing a basic one at first and planning on altering it from there. But I don’t know if I took the measurements wrong, or if I drew it out wrong (there was an awful lot of math involved), but the muslin I made on Sunday sucked. 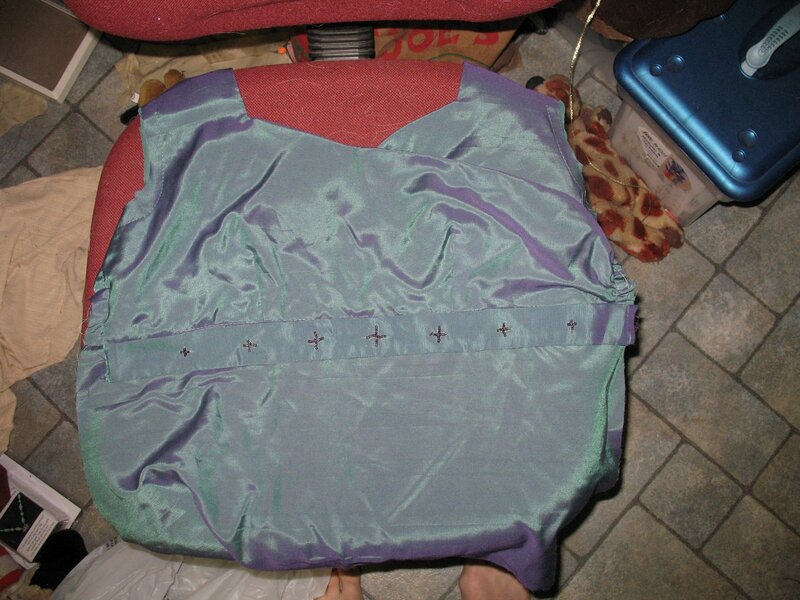 The shoulder seams were practically short sleeves, the extra length at the waist was sufficient to make it just hit my waist, and I didn’t like the placement of the darts at all. So I ditched that for now and went back to altering a pattern I had. It’s cut out, just need to sew. 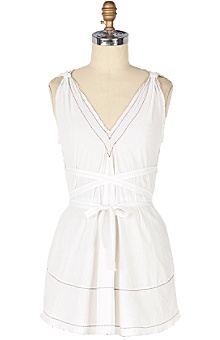 And I need to decide if I’m going to re-sign for the next few months of Wardrobe Refashion. I’m inclined to do it– the only factor is, I still haven’t figured out if I can make a winter coat warm enough for me with my wool allergy. I think I’m going to have to make some jewelry to go with it from the rest. And a closeup look of the wrap-look bodice– this was the part really inspired by Kiera Knightley’s dress in the last post, though hers went more to the waist and I didn’t have enough fabric to make it more than an empire-waist. So hopefully it’ll look all right when it’s sewed into the sides. Perhaps I’ll baste it first– if it looks bad, I can always just undo the basted gathering and make it a normal wrap, right? I didn’t have a chance to take a photo until today, but I finished the sweater-knit shrug to go with the Morning Glory dress on Thursday. It was kind of a pain working with the fabric in parts, since it would occasionally get caught in the metal plate under the presser foot of my machine (one time, it took both myself and my mom to get it out!) And it took a little longer than it probably would have under normal circumstances, because I did most of the seams as French, both for durability and to make it look more finished. The one place where I ran into trouble with this was the flounce on the sleeves, since I sewed them both the wrong way out and had to hand-sew the seam down to the outside. But it looks ok now. 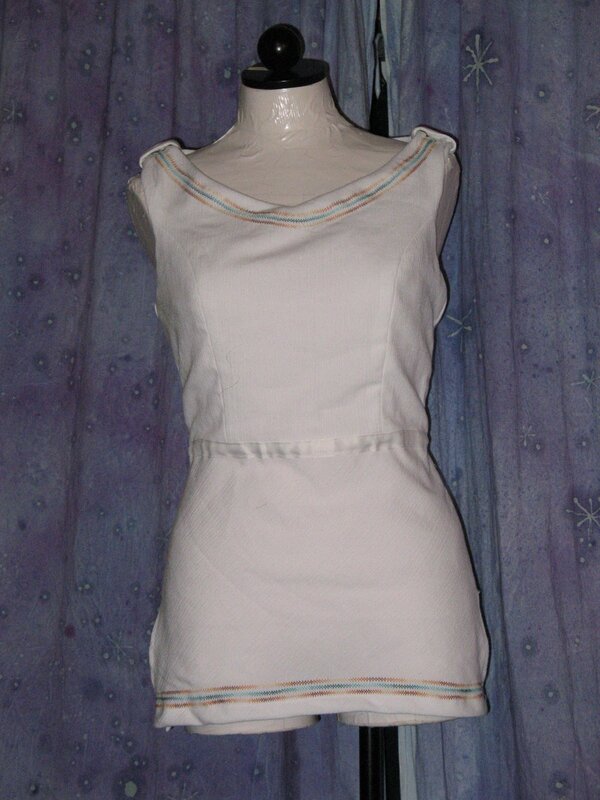 This was made from McCall’s 5096, though I altered it a bit– I changed the shape of the flounce to make it more pointed on one end instead of a round ruffle, and added it to the 3/4 length sleeve. I’m hoping I can find some other outfit to wear the shrug with besides the dress, though as you can sort of see from the picture, it matches the blue in the dress perfectly. Drat, I thought I’d taken a before picture of this. Guess not. Anyway, I started work on a recon I’ve had in mind for awhile tonight. I’d originally been playing with an olive green snap-down Gap shirt, but I don’t like anything I’ve played with to make it another shirt so I guess I’ll wait until I need a bag to deal with it. So instead, I’m working with this thrifted skirt that I got awhile ag0. It was an awful style, this elastic-waist yoked pleated thing, but I loved the fabric (a shimmery iridescent green-purple viscose.) I’m turning it into a short-sleeved top, since I’ve discovered that I’m badly in need of things with short sleeves that are NOT T-shirts to work in. 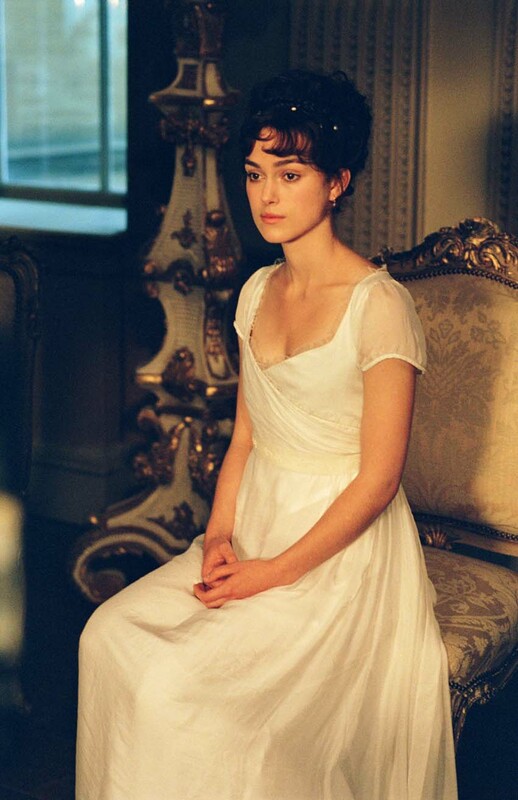 I’m altering a pattern that I’ve used before because I know it fits, but my inspiration is coming from, oddly enough, this dress from the newer version of Pride and Prejudice. I’m also planning on doing some beading on it, because when my best friend went to Africa last summer, she got me some packs of African-made seed beads there and one of the colors just happens to match it very well. So we’ll see how it turns out. I’ve got the altered pattern piece drawn out and the pieces all cut out so far. I’d seen tutorials at craftster.org before for cloth pads, and I had to admit my initial reaction was, why would anyone want to do that? Since then, I have a friend who’s switched to them and loved them. I’ve been becoming a lot more eco-aware as of late, and especially through people I’ve encountered from things like Wardrobe Refashion. I’m at the point where I’m quite annoyed with feminine hygiene products, of the disposable variety, because of just how much waste it generates. (Plus other things that I’m not getting into here because it’s TMI.) So I figured it was time to give them a try. My mom was ordering some diaper material to turn into kitchen towels from some site (don’t remember the name), and found some washable but waterproof fabric on there that’s used for diaper covers, so I got some of that for the bottoms. They also had a pattern, and I made two winged pad covers and four inserts yesterday. I tested one today, and so far so good, though I’ll have to see how it goes when things are heavier. But they were so quick and easy to make, and definitely more comfortable, so I hope it works! Even though all the flannel we had around here severely clashes with what I got for the waterproof layer. Oh well, I’m the only one that’s going to see them. I’m also making a shrug to go with the Morning Glory dress, due to the fact that I get cold ridiculously easily (one of my pet peeves prior to my ongoing conversion to granolaism was places that use excessive a/c, because I hate having to bring a jacket just to walk into a store without freezing in my tank tops!) I don’t know how warm it’ll actually keep me– I’d forgotten how loose a weave the crocheted-like sweater knit is. But the color matches the blue in the flowers perfectly, and if nothing else, it’ll keep the dress a little more modest for church (since I’m up front for the music a lot, definitely an important factor). 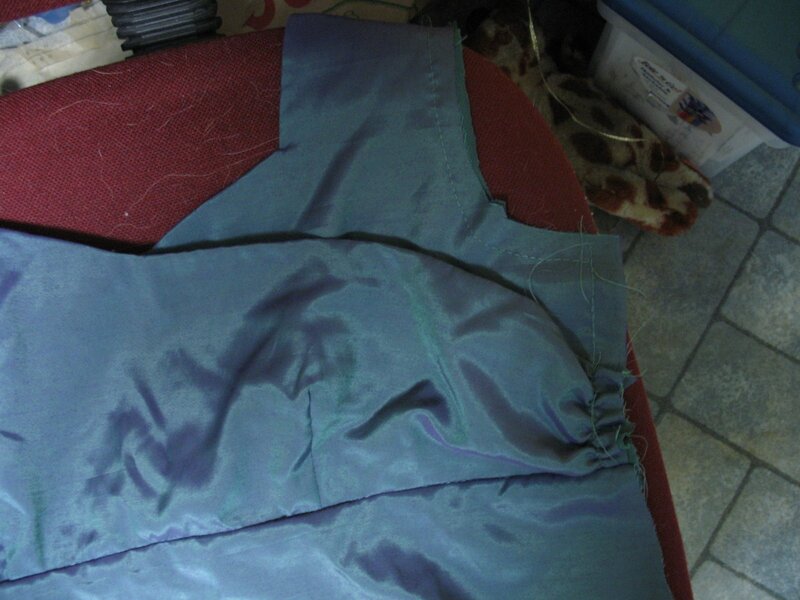 I just hope I can sew it up all right– I’m guessing I might have to French seam it all just to hold it together. It’ll be an interesting challenge, since I’ve never worked with this sort of fabric before.